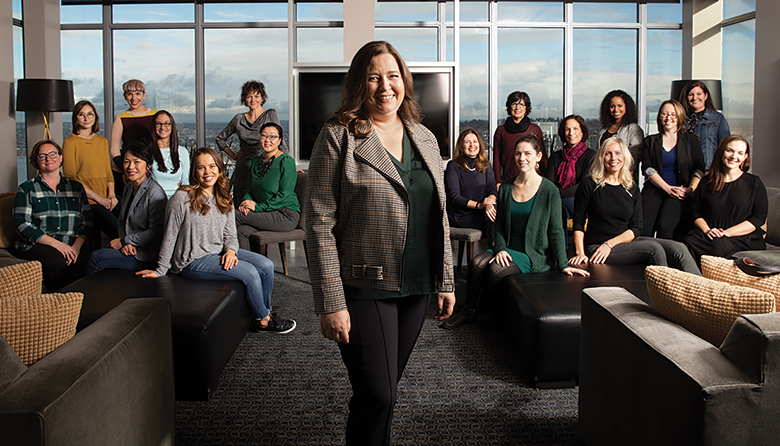 "For so many people here in Seattle, what keeps us busy, what keeps us overwhelmed, is stuff that has to get done, but not necessarily by you." In 2014, Sondra Firestein, an aspiring residential real estate agent from California, joined the tide of transplants moving to Seattle. 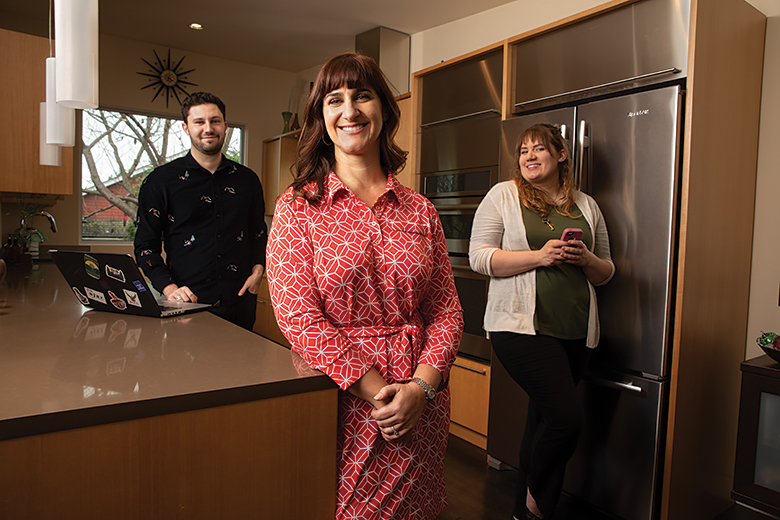 She got her license and quickly found work, only to learn Seattle’s growing swell left many first-time buyers — and the newlyweds she met in her part-time role as a wedding planner — in need of an entirely different resource. “Here’s this monumental event in their young adult lives and they hardly had any time for it,” recalls Firestein. Finding time to look at homes together was a challenge for these career-oriented young couples, many of whom seemed owned by their jobs. This common dilemma — and the realization that she vastly preferred coordinating details for clients to looking for residential real estate — led Firestein to found Pursuit Concierge. A lifestyle management company intended in part to help first-time homebuyers protect their new investments was quickly embraced by busy professionals overwhelmed by their soaring to-do lists. “For so many people here in Seattle, what keeps us busy, what keeps us overwhelmed, is stuff that has to get done, but not necessarily by you,” says Firestein. She intentionally structured Pursuit to accommodate those in need of part-time help. A $60 monthly membership fee and individual tasks measured in monetary “chip” values (because we’re chipping away at our to-do lists) lets clients use as much or little as they’d like. In five years, Pursuit has grown into a three-person team deftly fielding a diverse array of personal/professional tasks. Clients encompass a range of business owners, busy professionals and working parents. A divorce lawyer, for example, outsources her firm’s entire networking calendar, company outings and all of her dry cleaning, which couldn’t be delegated to an ordinary legal assistant. An interior designer recognizes that having Pursuit collaborate with clients and vendors is more cost-effective than hiring and training full-time employees. For all the routine running of errands, vetting vendors such as painters, handymen and plumbers, writing company blog posts and booking dinners and holidays, other charges can be far more complex. Firestein recounts helping a person with Asperger’s negotiate an interstate move, helping facilitate a construction project in Poland and even supporting one client as she sought treatment for an eating disorder. Basically anything can be put on Pursuit’s agenda, says Firestein, as long as it’s ethical, legal and safe. This scenario wasn’t necessarily the case in 2012, when stay-at-home mom Kara McKeage was brainstorming options for part-time work as her son entered kindergarten. “Things were just starting to explode in Seattle,” says McKeage, whose South Lake Union neighborhood offered a front-row seat to Amazon’s dramatic expansion. “I thought surely there are people who need help because they’re busy, they’re working long hours,” she recalls thinking. But even though personal concierge firms were at work in larger cities, McKeage could find only one other woman offering such services in Seattle, forcing her to look farther afield. After finding an Englishwoman willing to walk her through the process by phone, one of Seattle’s first luxury concierge companies, Pepper’s Personal Assistants, was born. Seven years later, Pepper’s continues to mirror its host city’s boom, with 17 full-time employees working around Seattle and the Eastside. The past two years have seen “phenomenal” growth, says McKeage, who has been strategic in building the company now that her boys are older. Its larger size, besides proving useful in crowdsourcing home vendors, has also helped Pepper’s narrow its focus, eschewing general admin, day care or housecleaning to manage household affairs for busy executives, professionals and working parents too strapped for time to even make a list. “Our biggest goal is to know what they need before they do,” she says, describing a subscription-based model that assigns a dedicated — and heavily vetted — home manager to handle repairs, maintenance, errands and chores, such as folding laundry, organizing closets, prepping meals, planning holidays and other things a housecleaner won’t handle. Full- and part-time plans start at $900 per week. Over the years, McKeage has seen many other companies seek to enter this space. So far nobody, at least in Seattle, has matched Pepper’s scale or exact business niche. Some have been short-lived, as was Seattle’s original errands service, MyLackey.com, which died when the dot.com bubble burst. Others, like Hello Alfred, a business started by two MBA grads in New York City — and not to be confused with vacation rental firm Stay Alfred — have partnered with property management companies, offering a perk to residents living in their luxury apartment buildings. Nowadays, concierges appear in luxury retail stores and corporate office lobbies. Recent years have also welcomed a fresh wave of tech startups, including HeyThrivy, an app-based company founded by three former Microsoft employees in 2017. “There’s always been the TaskRabbit (a service that allows consumers to find temporary help with everyday tasks) or the Craigslist to find somebody one-off,” says HeyThrivy cofounder Danna Redmond. The company differs from tech offerings of yore by providing a dedicated home manager clients can build a relationship with — as opposed to a “tasker” you’ll never see again — for unlimited errands. Both HeyThrivy and Pepper’s assign one employee to each client, which helps build customer trust and also allows home managers to identify needs because they visit regularly. HeyThrivy also offers an array of vendors, which are basically handymen, plumbers and other repair people the company has used and can vouch for. One challenge: Seattle’s construction boom has made it more difficult to find reasonably priced, quality vendors who are readily available. HeyThrivy has attracted new customers every week since it launched. It serves only Seattle and Mercer Island but is considering offering services on the Eastside as well. “We subscribe to music, we subscribe to food delivery, all these things,” says Redmond of society’s growing embrace of the subscription model. This shift — and internal research that found people less inclined to pay for individual tasks — inspired HeyThrivy’s own subscription model, lest people “nickel and dime” themselves out of getting any help. One surprise, says Redmond, has been the program’s popularity among single professionals and young homeowners, who relish HeyThrivy’s support navigating the new world of repairs and maintenance. “We really thought our target customer was going to be two adults, working, a dual-income family with kids,” says Redmond. The service’s more diverse appeal has inspired the team to send out seasonal reminders to schedule lawn care, window washing and gutter cleaning on top of the usual offer to oversee those home projects from start to finish. Since launching its pilot program a year ago in Seattle and expanding to Mercer Island in April, HeyThrivy has added a more basic program for condo/apartment dwellers. These clients don’t need HeyThrivy’s home vendors but want unlimited tasks and errands, including booking travel, and weekly “home boosters,” who tackle household tasks outside standard cleaning. Such work can be accomplished in a very efficient 60 or 90 minutes, depending on a $300 to $650 monthly subscription plan. Projects are tracked in a user-friendly app, which details the status of each job on clients’ desktops or phones, neatly batched on the back end and finally logged into a database creating a useful record for clients. "Out of the gate, we knew we needed to be very much tech enabled,” says Redmond, describing the company’s format as a must, considering Seattle’s savvy tech base. To Giovanni, who continues to coach and train aspiring concierges through her industry association, the International Concierge & Life Management Network, the movement has undergone a seismic shift since 1998, when maybe 20 independent concierges were working across the country. “It’s probably a billion-dollar industry right now and there’s probably a concierge in every major city,” Giovanni says, crediting tech companies such as Uber, Lyft, TaskRabbit and online grocery delivery services with helping the movement go mainstream. Moreover, the industry’s growth offers consumers more choice, because modern concierges — unlike during the early days when everybody targeted VIPs — tend to have their own niches. “There is something out there for everybody,” Giovanni says, pointing to the range of services offered by apps such as TaskRabbit and iTrust Concierge, a new company aimed at residential property managers, to luxury concierge companies promising customized service at a five-star level. People enlist concierge/lifestyle management services for different reasons, but it often boils down to seeking work-life balance. “You can’t do it all,” says Cami Gearhart, a senior executive who, like her physician husband, works 50- to 60-hour weeks rife with frequent business travel. Gearhart reached out to Pepper’s Personal Assistants three years ago when the mélange of leaky faucets, home repairs and cars in need of oil changes finally got too overwhelming. Now she can’t imagine life — at least as long as she’s working — without her part-time home manager in tow. “I know it’s a financial burden, but it really is helpful for personal well-being and marital bliss to have this kind of support,” Gearhart says, noting that businesswomen in particular often fall into the trap of thinking they should be able to do it all. Such attitudes might slowly be falling by the wayside, however, as a new wave of young professionals starts to embrace the lifestyle concierge concept. “I decided a long time ago that I could be the superwoman, do-it-all type of mom and businesswoman and it just wasn’t the lifestyle that I wanted,” says Natalie Hartkopf, a working mother, frequent traveler and CEO of contract furniture company Hightower, which she cofounded in 2003 at age 22. Hartkopf hired HeyThrivy last July after reading a story about the new startup, whose proactive approach has allowed the busy entrepreneur to spend her precious free time relaxing with family, which includes an equally busy husband and new baby. Even those who happen across concierge companies by accident tend to get hooked quickly. This is what happened to Maygan Wurzer, an overworked mom, widow and dance studio owner whose employees found and vetted Pepper’s on her behalf. “It’s the best money I’ve ever spent,” says Wurzer, describing a service that, although expensive, nevertheless pays for itself in peace of mind and extra bandwidth to reinvest in work and family. “There’s this mental block of saying, ‘No, I should be able to figure this out,’” says Raina Henderson, an interior designer who, despite hiring Pursuit Concierge to handle general administrative tasks for her company, initially felt bad about outsourcing errands and other drudgery. About a year in, however, Henderson has found Pursuit so beneficial that she sends the company 200 to 400 hours’ worth of tasks every month, all the while watching her own clients — particularly those working long hours at Amazon — as they start to embrace similar services.